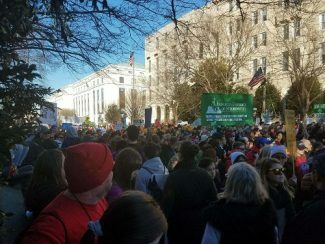 On Jan. 19, roughly 100,000 people from around the United States gathered for the 45th March for Life event in Washington, D.C. Among these individuals was Angela McCoy, administrative assistant in Academic Affairs at Newman. Brigette Sponsel and Angela McCoy sporting their Newman bags. A group of 750 students and their families filled the Church of the Magdalen for a “send off” Mass Tuesday, Jan. 16, which concluded with a blessing over all those traveling for the march. Priests, students and chaperones then loaded onto buses and left for their six-day pilgrimage. After McCoy heard that her church needed chaperones for the trip, she and her husband signed up. 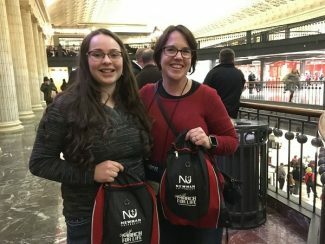 This was her daughter’s fourth year participating in the March For Life, her son’s second year and McCoy’s first time ever traveling to the nation’s capital. The first few days of the pilgrimage involved sightseeing and spending time in prayerful preparation for the march. An Adoration session was held the night before, and was set up as a reminder for participants to pray about what they were about to do, McCoy said. The group also prayed a rosary in front of Planned Parenthood. On Friday, participants gathered for a rally at the National Mall before the march, but this year was different. President Trump livestreamed his own speech addressing the March for Life — making him the first U.S. president ever to do so. Crowds gather at the March for Life. 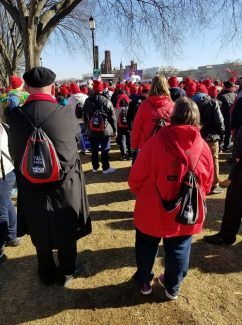 “It was neat historically to be a part of (the president’s address of the march), but also just to see the kids moved by the Holy Spirit,” McCoy said. “They are the hope for the next generation and are speaking for voices that can’t speak for themselves. McCoy said the 1.3-mile march took around three hours to complete because of how many people participated. The march concluded directly outside the Supreme Court Building. 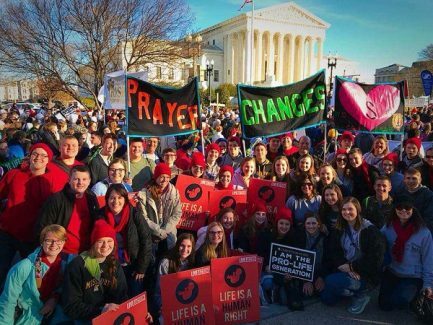 Newman sophomore Brigette Sponsel also attended the March for Life this year. This marks the third consecutive year that she has participated. Sponsel said, “It was a very positive and uplifting experience — full of hope and joy. They really emphasized how each person can make a difference, whether it be negative or positive. Bishop Carl A. Kemme and Bonnie Tombs, organizer of the march for the Wichita Diocese. In addition to the march, the trip came with many opportunities for sightseeing. McCoy’s group took a night tour of some major memorials including Lincoln, Korean War, Vietnam War, Jefferson and the Marine Corps. They also visited Union Station, the White House and Arlington National Cemetery, where they witnessed the changing of the guard ceremony being held. One afternoon was set aside for chaperones to take students on tours of Smithsonian Institution and other museums. One of the most memorable moments of the pilgrimage, McCoy said, took place after visiting the shrine of St. Pope John Paul II. McCoy was chaperoning six girls from the group when three of the girls recognized a few religious Sisters.